My sister-in-law made a Facebook post about the popularity of latch hook rugs in the late ’70s and early ’80s. 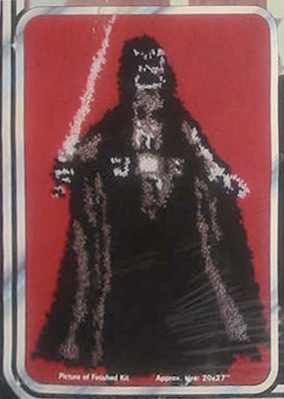 I thought it would be funny to find a Darth Vader latch hook rug and sure enough there was a whole series of Star Wars latch hook rugs. The “Star Wars Collectors Archive” has images of nine kits (links below). The best of the series is the full pose of Darth Vader. Shown above. With this unusual medium the best approach is loose generalism with interpretative representation of detail. In other words, when you try to sharply define a detail, it usually looks bad. The C3O crochet rug is a good example. It ends up looking clunky. Full pose Vader has just enough detail that it allows for the human eye to fill in the blanks. His non-lightsaber hand is a great example. And I love the random static-y appearance of his light saber. It gives a great sense of volatility and energy. Man I want this rug! A little further research reveals that these rugs apparently go for $150-200. Ouch!! his lightsaber is a blade of fire!